Noodles & Company is a fast casual restaurant chain where its globally inspired dishes come together to create Your World Kitchen. It is a restaurant where Japanese Pan Noodles rest comfortably next to Penne Rosa and Wisconsin Mac & Cheese, but where world flavors don’t end at just noodles. Inspired by some of the world’s most celebrated flavor combinations, Noodles & Company’s menu offers appetizers, soups, salads and sandwiches, too. Everything is made fresh to order, just as you like it, using quality ingredients. Dishes are delivered to the table allowing guests time to sit and relax or grab a quick bite. With more than 380 locations nationwide, from California to Connecticut, guests can find a location nearest them and take a tour of the global menu by visitingwww.noodles.com. 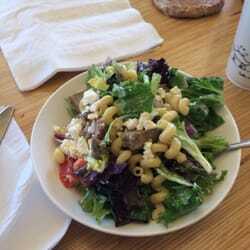 cavatappi pasta, spicy yogurt dressing. Pasta: Boil water and cook your cavatappi pasta according to package directions. Mine took around 8 minutes. Vegetable Prep: Wash and the tomato, cucumber, and onion. Quarter the tomato so you have 4 quarters. Then cut each quarter in half so you have 8 tomato wedges. If you don't like the skin on the cucumber use a potato peeler to remove it. Then slice the cucumber to your desired thickness. Peel the red onion then slice until you have the desired amount for your Mediterranean salad. On each of your slices be sure to break the layers apart. Open a can of olives and drain. Hit your garlic cloves with a pan to easily remove the skin. Then mince the garlic clove or use a garlic press. Use a grater to zest your lemon. Salad Dressing: Add the Greek yogurt, olive oil, sriracha hot sauce, lemon zest, lemon juice, minced garlic, feta cheese, and just a little salt and pepper to a food processor and blend until smooth. If you have an opening at the top of your food processor add the oil slowly while you blend. To Serve: Assemble the lettuce, cucumber slices, onion slices, tomato wedges, and olives on a plate, and top with crumbled feta cheese. Drizzle on your homemade spicy Greek style Noodles and Company med salad dressing on top. Optional: Grilled chicken, parmesan crusted chicken breast, or shrimp would make this Greek salad more filling. Copycat Recipes for items on the menu at Noodles and Company Restaurants.